Lugarawa Health Training Institute is owned by Roman Catholic Diocese of Njombe. It was established in 1998. 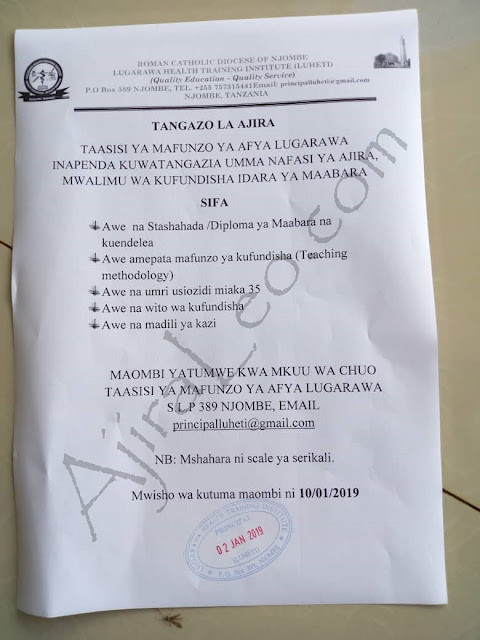 Lugarawa Health Training Institute offers a two year nursing course leading to an award of certificate in nursing and midwifery (NTA level 4) under the National Council for Technical Education (NACTE). The school enrolls an average of 60 to 70 students per intake where by both male and female students are admitted in the programme. The aim of this institute is to produce committed and competent health workers on cadres of Nursing who will be promoting health, providing health services to persons in need and preventing health problems of the community by utilizing concepts of primary health care as stipulated by National Health Policy. Lugarawa Health Training Institute is located in Njombe region (formally was Iringa region) at Ludewa District, 96 kilometers located in the northern part from the district Headquarter within the St. John’s Lugarawa mission premises. The environment is cool with long rain season from November to May which makes the nature green and flourishing for the whole year.